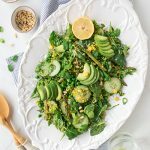 This super easy, healthy and vibrant spring green & quinoa salad is inspired by all the fresh spring flavours. Crispy, crunchy, zingy & fresh – it’s so rich in flavours and textures. Best of all, it comes together in just under 25 minutes and requires minimum cooking skills. A perfect vegetarian/vegan dinner side or lunch. Officially, it was the first day of spring yesterday, as it was the day of the spring equinox. It fills me with so much joy to finally see the trees starting to blossom and for all the vibrant colours to come to life. I’m definitely done with hibernating for the winter season and I’m so looking forward to embracing the Spring on every level, both spiritually and physically. 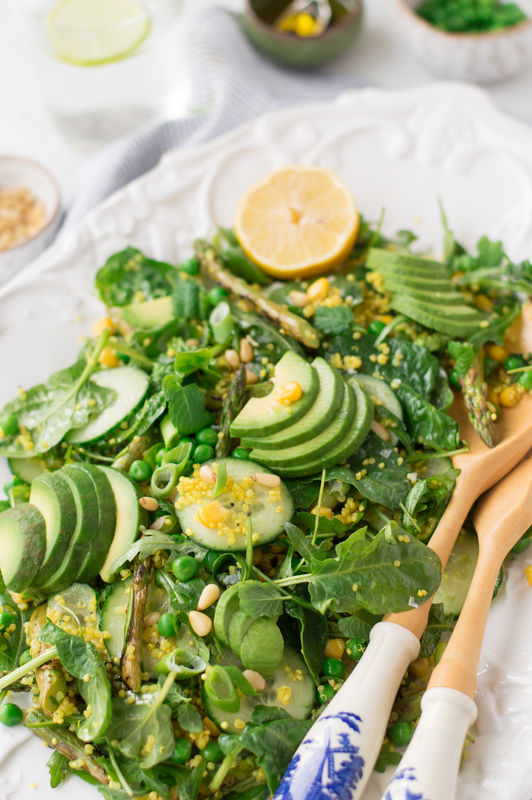 Having returned from my local farmer’s market the other day with a bag full of greens (I think my body is trying to tell me something…), I thought it would be a great idea to put all the spring greens into a vibrant healthy salad for a quick-fix meal. To make this nutritious green salad a little more interesting, I added a teaspoon of turmeric whilst cooking my quinoa. I find that it makes quinoa more flavoursome, as well as more nutritional. My advice for perfectly fluffy quinoa is to cook it using the ratio of 1 part quinoa to 2 parts water. Once you’ve combined quinoa and water, bring it to a boil, stir in the ground turmeric, season with salt and pepper, reduce to simmer, cover with a lid and don’t stir until all the water is absorbed. Then just fluff it with a fork and ta da – it’s ready! When it comes to greens, just add whichever green veggies your heart desires – you’ll never go wrong! 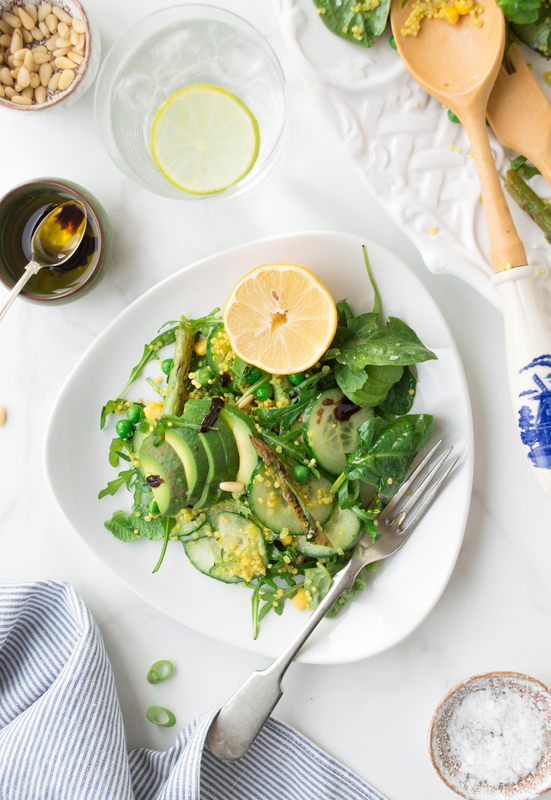 I used a combination of crispy asparagus, fresh peas, crunchy cucumber, spring onions and creamy avocado. 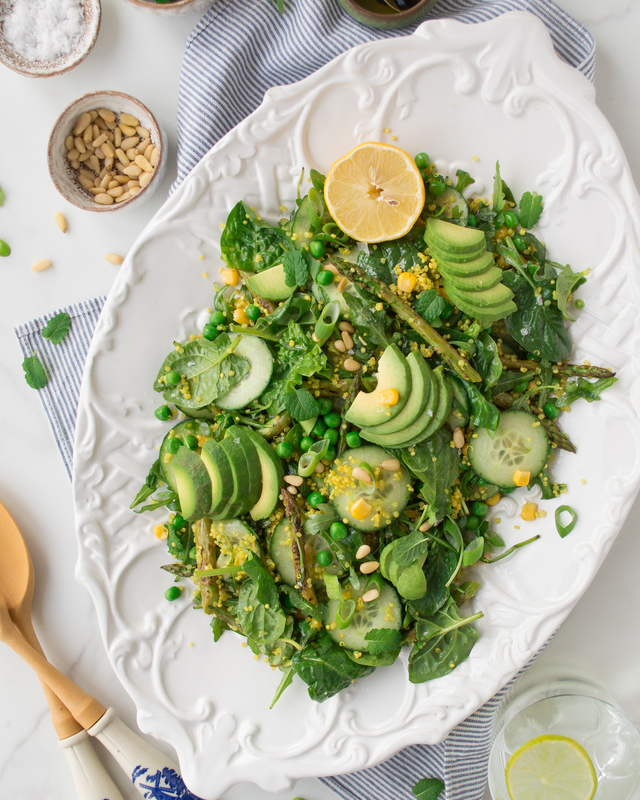 I really hope you get to enjoy this fresh and vibrant spring green salad. If you make it, be sure to drop a comment below and tag me on Instagram (@fit.foodie.nutter #fitfoodienutter), so I can see your take on it. 1. Combine water and quinoa in a saucepan and bring to a boil. When it starts boiling, add ground turmeric, season with salt and pepper, cover with a lid and simmer on a medium heat for 10-15 mins until all the water is absorbed. When cooked, fluff it up with a fork and let it cool down a little. 2. Whilst the quinoa is cooking, heat up the olive oil in a grill pan. When the pan is really hot, add the asparagus, season with salt and pepper and cook on high heat for 3-5mins until the asparagus is tender yet still a little crunchy. Set aside. 3. 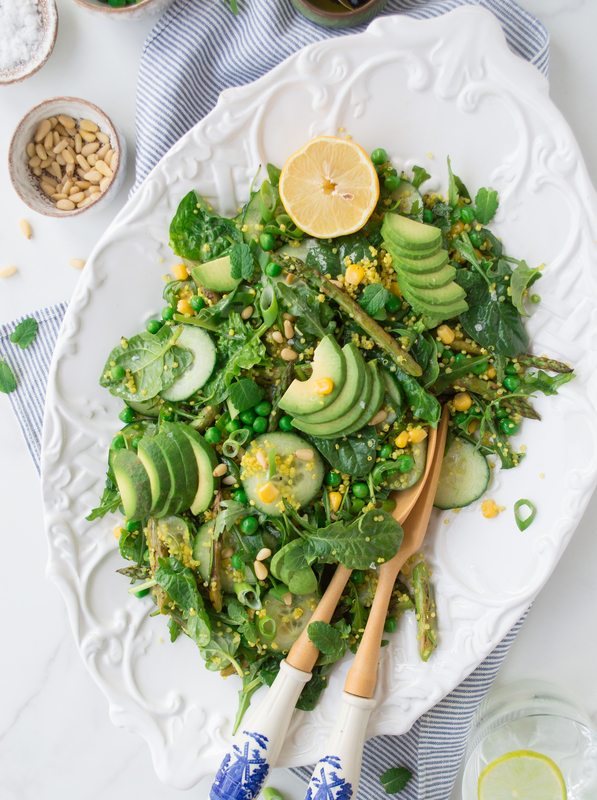 In a big mixing bowl, combine fresh peas, sweetcorn, cucumber, spinach leaves, pine nuts, mint leaves, spring onions, avocado, grilled asparagus and slightly cooled quinoa. Squeeze the lemon juice and mix well. 4. To make a dressing, combine the ingredients in a jar and whisk well. Pour over the salad just before serving. MMM I just recently had a quinoa salad out and wanted to recreate it at home. Your version was spot on. Love the tumeric, too! Thank you so much Jenna! And I love having some inspiration when eating out too! This salad is so pretty! I love how vibrant it looks. I bet it tastes even better. Thank you so much Jori! It does taste rather delicious, if I may say so myself. Hope you get to try it soon. Beautiful looking salad. Absolutely love all the fresh vegetables in this. I could eat the whole thing. Thank you Andrea. I had the same problem – struggled to put my fork down to stop eating it! The colours are so vibrant and this salad is absolutely stunning. Will be made weekly during spring here. 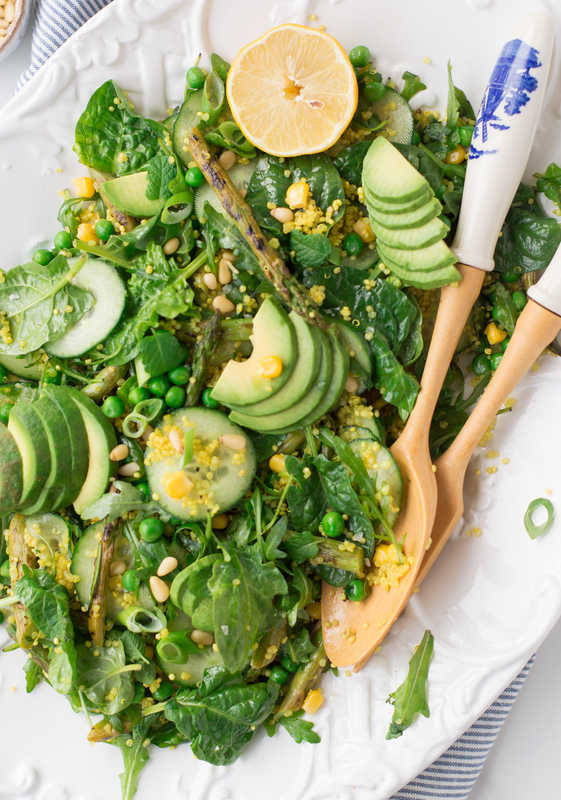 What a perfectly green, spring salad! I love all the ingredients and those pops of yellow make it look so fresh and inviting. Great recipe!! OMG this was so good. I used organic frozen peas and corn. Omitted quinoa and served as side with lemon pepper salmon. I cleaned my plate and almost licked it. This is my first time coming across your website (via this recipe on pinterest) and I will be trying a lot more of your recipes.